I got the idea to make orange marmalade the day after Christmas, when I was sitting at the kitchen table in my parents' house with my dad and Eugene watching an old rerun of The Barefoot Contessa. In the overly-scripted episode, Ina was home in her spacious Hampton's kitchen, working on an elaborate breakfast basket which she'd (allegedly) been commissioned to make by her friend Barbara's daughter who, as Ina reminded us multiple times, had just had a baby named Summer. Summer's mom wanted to surprise her own mother with a visit and so she and Ina were "conspiring" to surprise the new grandmother with a Barefoot Contessa breakfast basket. Ina spent two days laboring on this thing, complete with date nut bread, orange cream cheese, muesli, yogurt, fresh fruit, and homemade orange marmalade. It was an easy recipe: 8 navel oranges and two lemons are sliced thinly, then brought to a boil in a big pot filled with 8 cups of water and 8 cups of sugar. Once the sugar dissolved, Ina let them soak overnight at room temperature upon which she brought them to a boil again and let the liquid reduce and the fruit come up to about 220 degrees (F). Then she poured this into mason jars she sanitized in the dishwasher (without soap) and added to the raffia filled basket. In the episode, Summer's mom showed up and with barely more than a thank you, hurriedly grabbed the basket to head over to Barbara's house. Barbara was overcome with surprise to see her daughter and new baby (although not, interestingly enough, the Food Network camera crew that met them at the house and followed them into the kitchen). The worst part, and the part that has me thinking very little of Barbara's daughter, is that she completely TOOK THE CREDIT FOR INA'S BASKET!!!. Her mom was all like "You made this yourself?!" and she was all like "Yes I did!" I don't know if you read my blog, Ina Garten, but if you do, you should stick with Jeffrey and your entourage of gay male cheese-shop-owning friends. They, at least, give credit where credit is due. I’m incapable of leaving well enough alone (even when it’s an Ina Garten recipe), so I altered my marmalade slightly with the addition of the juice of a third lemon, a pinch of sea salt, two whole vanilla beans, and a swish of balsamic vinegar. The result was a sweet and bitter marmalade redolent with hints of vanilla. I also used a food processor to process about 2/3 of my marmalade to give it a smoother texture. The best part, though, are the gorgeous specks of vanilla suspended throughout the finished bottles. 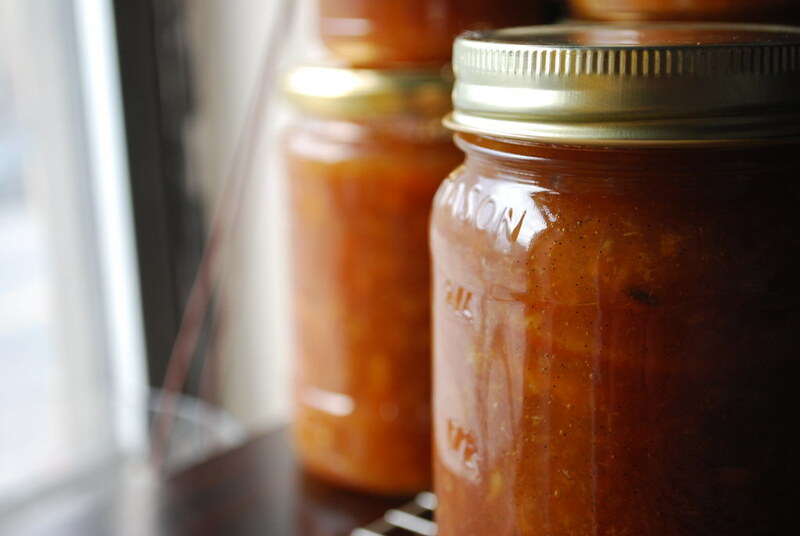 The marmalade will keep in sanitized jars for about a year in the pantry (if it lasts that long, of course), or you can just pour it into any heatproof container and store in the fridge for a month or two. I gave a few of my jars away and kept three to enjoy with Eugene on our morning bagels or, in his case, on a cracker with a mug of tea. 1. Cut the oranges and lemons in half lengthwise, then slice thinly into half-moon slices (by hand or with a mandolin). Be sure to toss out any seeds in the lemons. 3. After the oranges have soaked for at least 8 hours, bring the heat back up to a boil then reduce to medium-low and let simmer uncovered for about 2 hours. Swirl in the tablespoon of balsamic and the teaspoon of salt and stir into the fruit. 5. Remove the vanilla beans and cut into large pieces, one for each jar. Pour the marmalade into clean, hot canning jars (I used clean old jam jars that I ran through the sanitizing cycle of my dishwasher) and bury a piece of vanilla bean in each. Wipe the rims with a damp paper towel and seal. You can store in the refrigerator or in the pantry for up to a year. I'm amazed that you were able to remember all these details about the episode. I watched that same episode and could only remember the awful acting, never mind that the basket was lined with... raffia? Who even knows what 'raffia' is? Something about this recipe just totally strikes me... And I want to make it right this second! Wow. I don't know why the vanilla, balsamic and citrus has me so excited, but it DOES! I remember the whole episode too - see foodies remember these things and I saw the episode a long time ago! I triple love orange marmalade! 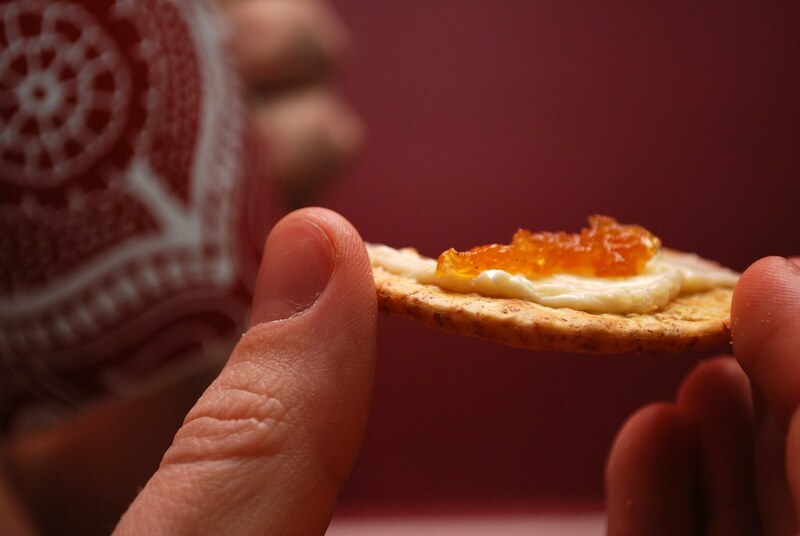 Vanilla-flavored orange marmalade sounds wonderful! I'll have to try this. I'm totally the same way - I can't leave any recipe as it is. I must tinker with it! Your additions, especially the balsamic make this so much more interesting! Hahah love the write-up about Ina. Your marmalade looks delicious! Awwwwesome. 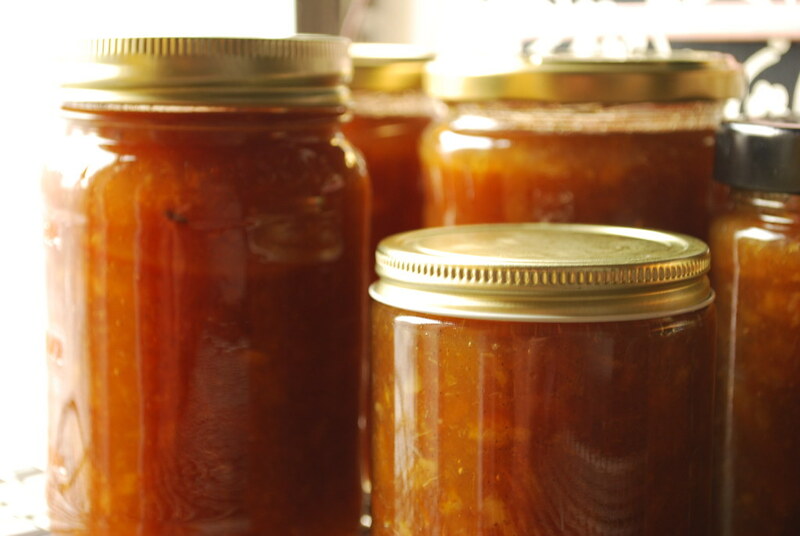 I really need to make some marmalade, I made so much last winter. I just don't have any jars! I watched the same episode that day and also immediately knew I had to make marmalade. Since I have a lime tree and limes tumbling out of every large bowl in my kitchen, I obviously went the lime marm route. I didn't bother looking up a recipe at all and just tried to stay as close to Ina's recipe as I could remember. No exact measurements - just trying to estimate what they all looked like in the bowl together. It turned out great. I will definitely try it again. I love the little vanilla bits floating in yours. I never knew how simple it would be to make a marmelade! I may have to give it a try this winter. Your version sounds delightful! One question though.. you didn't need to process the cans in water to get the seal? And, they are still good for a year?